It is impossible to tell where this screen adaptation of Where the Wild Things Are would have ended up without Max Records. He is the human star of the film, mingling with monsters that represent his thoughts, feelings, and actions. Before he travels to that land of weird creatures, Max is at home, struggling for attention. Records is nothing short of brilliant here, sitting under his mother’s (Catherin Keener) work desk while he tells a story. Everything about this moment, from the way Max plays with his outfit, the way his eyes move, to the fluctuation in his voice, is perfect. His eventual acting out, standing on top of the kitchen table in defiance of what his mother is doing, could not have been handled any better. Director Spike Jonze utilizes the camera to present some stunning imagery, bringing the fantasy world to life once Max runs away from home. This is not bright, happy visual splendor. Much of the film is grim, lacking color, becoming increasingly bland as Max’s own created world begins falling apart. Carefully framed scenes make this all believable, although whether it is effective is certainly an area of contention. It is hard to imagine kids enjoying this film. The book, as slim as it was, was quick enough to hold a child’s attention. The playful monsters early in the film are undoubtedly captivating, literally Max’s wild side running free. They jump, frolic, and have fun, much to a young one’s delight. 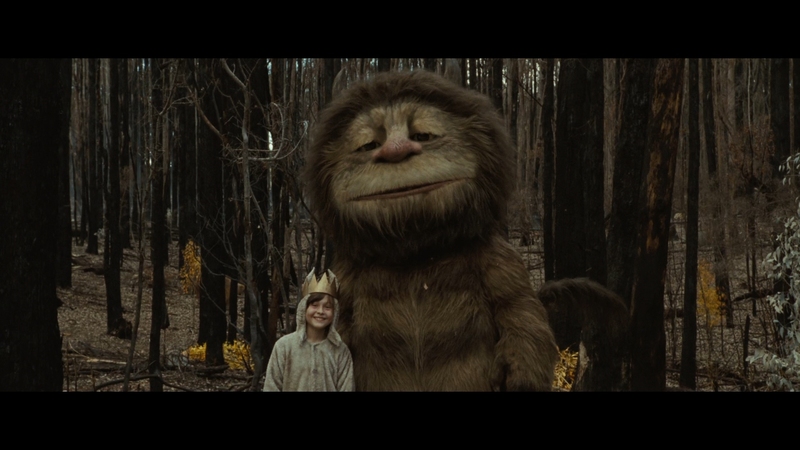 Whether a child makes the connection later, when Max reveals his true origins to the Wild Things, is debatable. This is a departure for children’s films, where the movie grinds to a halt as the monsters display feelings. Undoubtedly challenging material, but also difficult to keep a young mind moving. Warner Bros. actually considered re-shooting the entire film, and it is rather clear, even in this version of the film both Jonze and Warner agreed on, that any executive would gasp when they see the finished product. While this expands on the book properly, by creating individual personalities out of the Wild Things, trying to sell this to a young audience is almost impossible. Surely some will find this material easy to relate to. That is why the original book was such a success. It is also great this film was delayed for years by author Maurice Sendak, as the technology on display here is spectacular. The mixture of live action suits and computer-generated faces is never a let down. 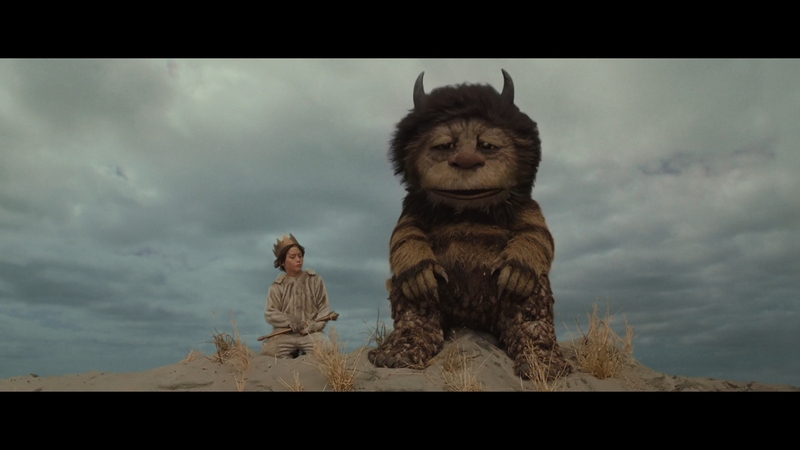 Spike Jonze made his movie with Where the Wild Things Are. This has led to a technically flawless piece that is beautiful to look at, amazingly well acted, but in the end, sluggish and dull. Childhood imaginations should never be this lifeless, and Max’s situation is hardly seems built to a point where he would have an imagination that mirrors this level of depression. There might be something amiss with Warner’s VC-1 encode for the film. For the few scenes that stand out, mostly at the start, there are countless others that disappoint. Obviously color saturation is only noted prior to entering the land of the Wild Things, and the general vibrancy is impressive to the eye. Sharpness is also exceptional, bringing forth some fine details. Look at the snow as Max plays around building a fort. It seems as if each flake is clearly visible, glistening and defined. Once into his imagination, the film becomes intentionally muted, and that is fine. Technical issues, whether part of the source or this encode, are constantly noted. Noise/artifacting is a general problem on the Wild Things’ faces. This begins to muddy detail, including their facial fur or any texture. Typically, their fur-filled bodies show excellent definition. Banding is evident against the night sky as Max travels to the island, beginning around 16:08 and continuing through his arrival. There are shots that appear processed, such as Max’s face at 1:15:00. Not only is fine detail absent entirely, but everything appears smoothed and digital. The grain structure is fine, unobtrusive and natural, so any digital manipulation is an unlikely culprit. Long shots of the forest are also unimpressive, failing to deliver any significant definition even when in clear focus. Black levels can be flat and uninspired, although they generally stand up to scrutiny. This is not a film that is supposed to look striking, but many of the problems seem to be part of the encode. While free of edge enhancement, things look amiss too often to rate this highly. The highlight of this DTS-HD affair is the bass. From the amazingly crisp waves pounding into the shore during Max’s journey to the footsteps of the monsters, the low end is constantly impressive. Not only is it deep, but it delivers that satisfying rumble in the process. Surrounds are typically engaged in some form, whether that is general forest ambiance or activity from the creatures. The dirt fight is great, with debris captured in all channels as the balls shatter. Likewise, the monsters playful sides are brought to life, including superb split stereo channels (and again, the journey on the water is an excellent example). Positional dialogue and movement are captured without missing a cue. The upbeat soundtrack is clean, also catching a bit in the subwoofer to add that additional presence. A nice bleed into the surrounds is also satisfactory. Extras begin with Higglety Pigglety Pop, a short based on another Sendak book, and produced by Jonze. The miniature work and puppetry used to bring this to life makes it worth spending 23-minutes with. An HBO First Look is your typical promo piece that runs 13:02. The rest of the disc is filled with short featurettes. Maurice and Spike repeats much of the content from the HBO piece while discussing the book, and why Jonze was chosen. Max and Spike focuses on the director and young star. The Records Family recounts the story of how Max landed the role. Carter Burwell is a piece on the composer, followed by a funny piece that is explained by the title, The Absurd Difficulty of Filming a Dog Running and Barking at the Same Time. Two on-set pranks are featured, with the follow-up being the last extra, The Kids Take Over the Set, the latter dealing with the little ones who were always part of the crew. All together, these short blips run a bit over the 35-minute mark.